This is a graphic novel about a noise rock band, based in an alternate reality version of Chicago, and their community of friends and acquaintances. Though beset with disaster at every turn―and frequently reduced to squabbling―they stick together because the band is the core of their existence, and they help each other find their way. 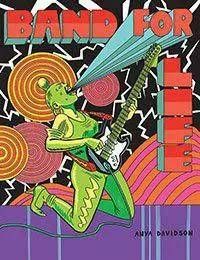 Band for Life is a love letter to people compelled to create with no hope of financial reward.